This is part two of my #SeriousWriters blog tour which discusses the lifestyles, advice, and opinions of people who are serious about writing. 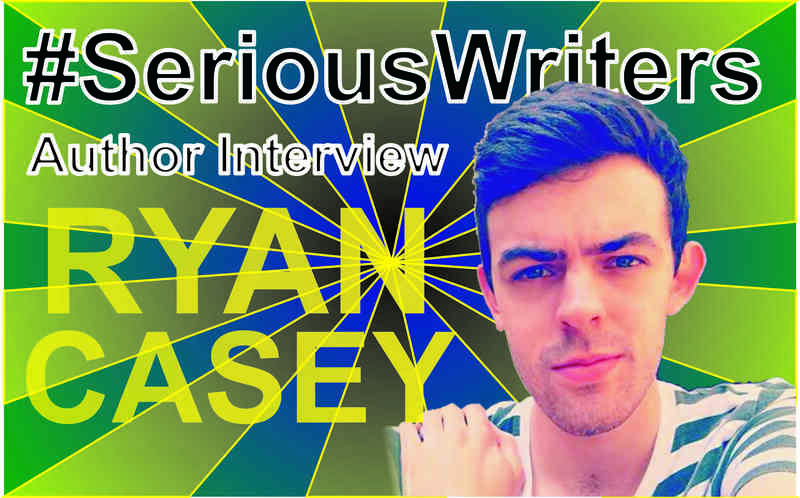 This time, I invited bestselling “dark suspense” author, Ryan Casey, for an interview in which we talked about his crazy release schedule and the future of reading habits. Dan: Hi, Ryan! Could you start by introducing yourself and telling us a bit about your work? Ryan: Hi everyone. I’m Ryan Casey, a full time fiction writer from the United Kingdom. I’ve written and published over ten novels, an Amazon bestselling serial, several novellas and short stories. I tend to write what I call “dark suspense”, which is a broader umbrella for the mysteries, thrillers, horror and science-fiction that I write. Dan: What led you to begin a career in writing? Ryan: I’ve always loved telling stories from a very early age. I know that’s the clichéd answer, but some clichés are clichés for a reason! I saw a great opportunity to tell my stories in the current publishing landscape and wanted to make the most of it. So far, that method seems to be working very well, so I can’t complain. Dan: You’ve released 10 books in the last year! That schedule’s crazy! Do you ever not meet deadlines? Ryan: Thanks! Well, I had over half of those books written in the years before last year, so I’m not as prolific as my release schedule portrays – honest! I’ve been writing stories for years so I have quite a backlog. Realistically I only wrote a few things last year. But I’ll take the praise! That said, I’m a full time writer, so I spend a full working day writing and editing every day. The only deadlines I set are for myself. I actually prefer not to work to deadline, but I always meet them if I do set them. I prefer to just set a daily word quota and feel incredibly guilty about not making it half the time. Dan: You release a lot of fiction in short episodes. Is this purely to make writing a viable career choice, or do you think the way people consume fiction is changing? Ryan: I just do this with my Dead Days serial because my goal is to create an experience more like a TV show, written and structured in that form. So six episodes make up a season. I only do this with Dead Days though – the rest of the time I prefer to just write full novels. It’s interesting to examine how reader habits are changing, though. Dead Days is my best selling series, so what that says about the modern obsession with good serial television I’m not sure! The thing is, serial fiction is an art and a form in itself. A lot of readers get pissed if they start reading a novel on Kindle that’s been chopped to pieces and sold at 99c per chapter. And rightly so. Serial fiction is a different form to the chopped up novel. I think there’s a great market for good serial fiction, written and structured like television episodes and series, in this new world. Dan: When it comes to writing a series, do you plan the whole plot in advance or dive right in and come up with an ending later? Ryan: I tend to have a lightly traced roadmap of the plot ahead. I like to know where I’m going to end so everything is pulling in that direction, however quickly or slowly. I also like to know a few shocking moments along the way, but I tend to leave the more minute details flexible to change. I think of it as the torchlight in the forest analogy. I know how I’m getting in, I have an idea where I’m getting out, but the monsters inside the woods are free to creep up and surprise me. So yeah, I’d say I have an overall idea in my head of where I’m going to go, then I just go and explore that idea in the most engaging and exciting manner possible. If the plot wants to drag me in another direction though, I’ll trust that instinct. I can always clean up the mess later. Dan: What kind of research do you do before writing? Ryan: It depends on the project. Some of my books are set in my home town, so I know all there is to know about that place. Others need a bit of police technicality research. Dead Days involves quite a lot of scientific and medicinal research. I always research while I’m working on another project though. Otherwise it’s far too easy to get weighed down in it instead of the writing. Ryan: I think it’s a great way for two or more like minded writers to produce work. Ryan: Trust your gut. It’s usually right. I just released the fourth book in my Brian McDone mystery series. It’s called Eye Snatcher, and it’s about McDone’s attempts to stop a horrific serial killer terrorising the children of Preston. It’s dark as hell, but it’s got a lot of depth to it too, as with all the McDone books. McDone is a really layered character that flies in the face of many police detective clichés. He’s great fun to write. Ryan Casey is the author of 10 novels, the Amazon bestselling serial Dead Days, and several short titles. All of his books are available on Amazon. His latest novel, Eye Snatcher, was released on the 24th November 2014. More information about Ryan Casey can be found by following all of the links below.